There are 17 people who are recorded with GREECE as their place of birth in this Ancestry.com database. I have transcribed the names and listed them below for your review. Please view the database and photograph albums directly for more information. If you do not have a subscription to Ancestry.com, most U.S. libraries offer access for FREE. 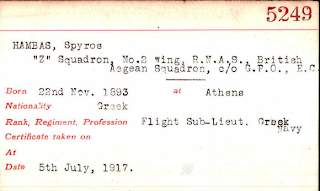 This database contains approximately 28,000 index cards and 34 photograph albums of aviators who were issued with their flying licences (certificates) by the Royal Aero Club from 1910-1950. These included the first military and naval personnel to become pilots. The Royal Aero Club is the national organization for air sport, including private and recreational flying, in the United Kingdom. On the back side of the index card, if anything, is usually a photograph of the pilot. 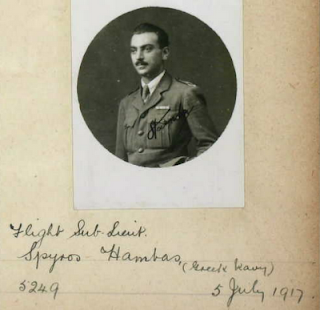 The 34 photo albums contain approximately 13,000 photographs of Royal Aero Club pilots. The albums and photos are organized according to certificate number, with four photographs per album page. Album no. 4 is missing from the original collection and so is also missing from this database.